Colorful nuggets of goodness, that’s what these are! 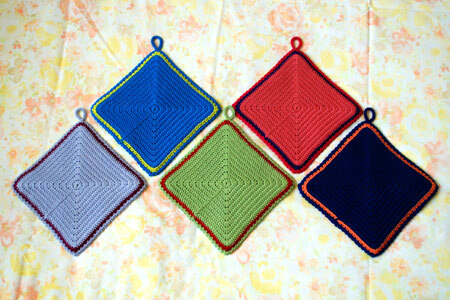 The 2010 potholders for the swap (on Ravelry, on Flickr) are complete! Much like the ones I crocheted last year, I am so happy with how they turned out. Pattern: Motif #6 from “Handmade Crochet Book.” I purchased my copy here on eBay. The back is Solid Square (#149) from 200 Crochet Blocks . Following a charted Japanese crocheting pattern is a piece of cake and a non-issue, really. No knowledge of Japanese was required, so I was good to go immediately. I was even able to extend the pattern by several rounds to make it a little bit bigger without any trouble. Because I crocheted square potholders for last year’s swap, I wanted to try a new shape this year – circle, hexagon, or triangle… anything other than a square. And I found many excellent potential patterns which fulfilled that requirement. 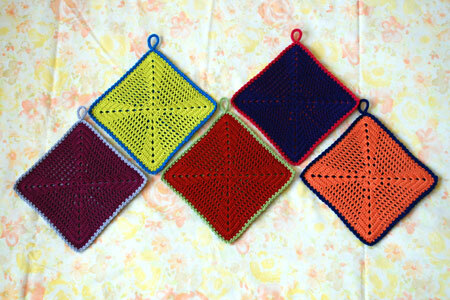 Unfortunately, as you can clearly see, I ended up crocheting another set of square potholders. FAIL! Oh, well, there’s always next year ;). Yarn: Tahki Cotton Classic, 100% mercerized cotton, 108 yds/50 grams. Less than 1 skein of each of the following: 3352 (orange), 3407 (tomato red), 3418 (magenta), 3453 (coral), 3701 (light green), 3723 (acid green), 3806 (bright medium blue), 3873 (dark blue), 3933 (light purple), 3940 (dark purple). There was also a tiny splash of 3456 (deep pink) for one of the borders when I ran out of 3453 (coral). 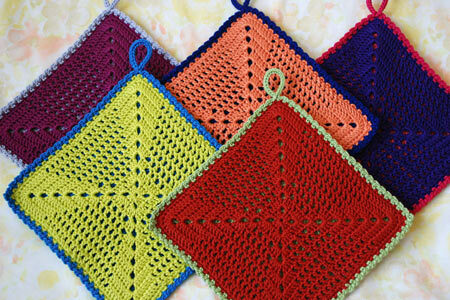 I am beyond thrilled that 90% of this year’s potholders were crocheted using leftover yarn from last year’s swap. Not because I’m particularly thrifty or anything like that… At this point, after two potholder swaps, my stash of Tahki Cotton Classic is basically down to zero. Which means I get to choose all new colors for the next swap! Crochet hook: size C (2.5 mm) from this set , which is still my favorite (use code HPF114 for 50% off). Finishing and finished dimensions: First, I connected the front and back with a round of single crochet using the front color. Then I crocheted the two edging rounds (straight from the pattern) using the back color. While working the edging, I added a little loop. 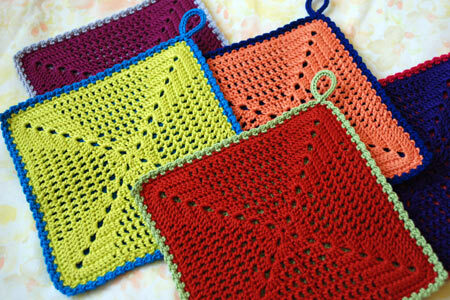 I steamed the potholders to flatten them and coerce them into 7″ squares. They are really lovely!! I remember seeing your beauties from last year. Thanks for sharing. Awesome! I love all the colors and the pattern. I love the colors you chose! Beautiful stuff! These are beautiful and I love the colors. I didn’t know that I wanted to crochet potholders until I saw that top set. Love the pin wheel effect. These are beautiful! I love the color combinations you chose. So very pretty!!! Love the colors! i love them! they’re so simple and still so beautiful. i love the colors. Those are awesome, so bright and cheerful! Fabulous colors! Too bad the set can’t stay together. And I love the simple tailored-looking patterns. So nice and practical too. These colors are wonderful. I have a ton of this yarn and I think next year I’ll have to join in this fun project. I love all the variety and all the color! You did your usual perfect job — no half a$$ work for the Grumperina!!! 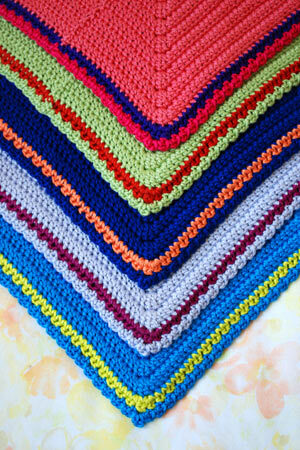 They’re beautiful – and as I confessed before, I don’t even like crochet! Nice colors! They all look perfect! Great pictures! I finished my potholders and then realized there was no way they would make it in time unless I did uber expensive Express shipping. Makes me so sad, because I really enjoyed getting interesting potholders in the mail. I’ve been waiting for the potholders! Yea, they’ve arrived and are as gorgeous as I expected! I’m really loving the simplicity of the pattern you chose, Kathy, especially when combined with these knockout colors. You “done good”, to use a local phrase. Those are soooo pretty! Makes me want to learn the craft of crochet! Those potholders were really nice – very pretty – I especially liked the ones in the 2nd photo – Nice colours, and I just love the simplicity of the pattern! Really pretty! It’s so great to see “ordinary,” useful FOs like this. Did you catch the recent issue of Piecework magazine that was all about everyday textiles–such as potholders and afghans? It was interesting and sometimes pretty moving, too.